Our wide range of products specifically tailored to the education sector. Our friendly team of experts aim to provide the right solution for every stage of need and budget. We understand that your student enrolment needs to be a quick and efficient process. To help you achieve this, we can provide a complete ID card and accessories solution. 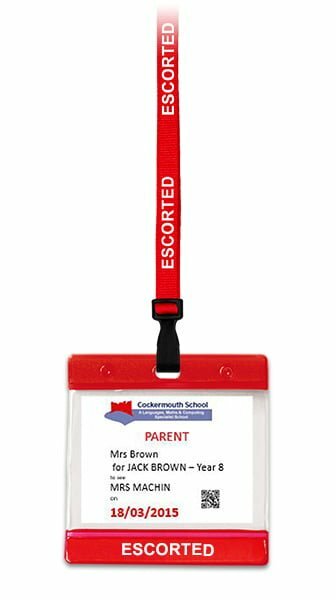 Our products for enrolment include ID technology cards, card printers, ribbons, lanyards, card holders, wallets, clips, attachments and yoyos. Personalised staff identity cards help to heighten internal security. These can be used with our wide range of card holders, wallets and plain, printed or personalised lanyards. Simply add your school or college logo and branding to make the ID cards unique and easy to recognise. To comply with the Department for Education (DfE) safeguarding legislation, all visitors and contractors must sign in and out of school buildings. Our wide range of visitor and contractor management systems are supplied based on your unique requirements; they range from a simple paper based visitor book system all the way up to our market leading visitor management software SkyVisitor. In most cases, visitors need to be Disclosure and Barring Service (DBS) checked before entering the building. Those who are not must be escorted/supervised on the premises at all times. For extra security, we can supply you with a recognisable pass to be issued to these visitors, i.e. a red coloured ‘escorted’ lanyard and wallet to make it visibly clear that they are an escorted visitor. Standard visitor passes which are issued can either be reusable or temporary. 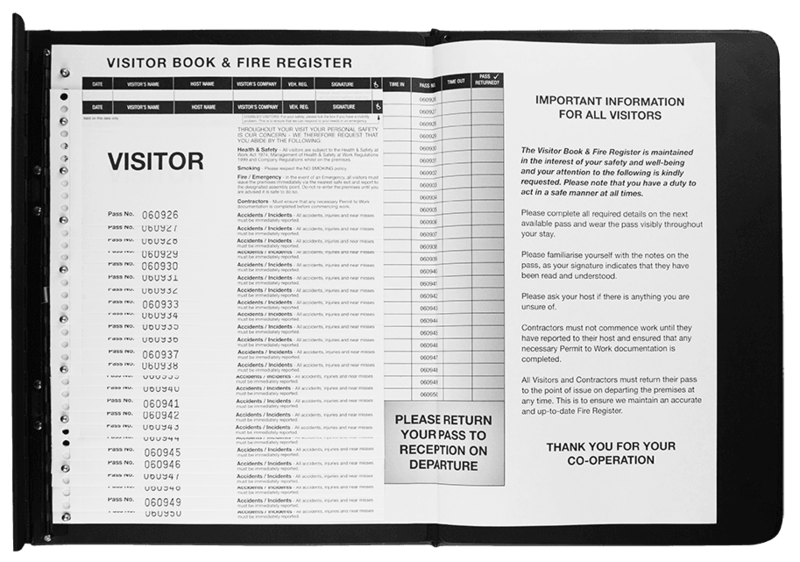 Our one-write paper based system includes tear-off temporary passes and includes a fire register of all visitors in the building. Have contractors on site? We also provide various types of permits to work to be issued to contractors. Dramatically improve the security of your building with SkyPax Net2 Access Control: Issue area restricted passes to staff and visitors, include more visitor check in options (QR code scanner, desktop reader, wall reader) and increase access control with pin codes and finger print biometrics. All our accident / incident / illness systems allow Local Authorities Schools to comply with the requirements to record and monitor minor accidents where pupils are injured. 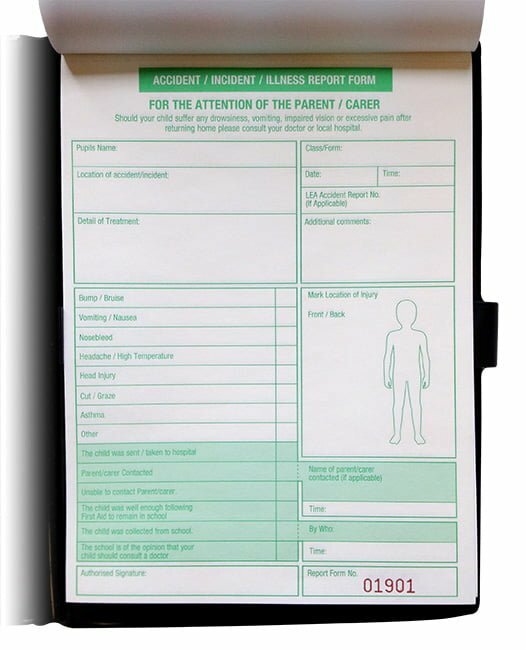 These systems keep a record of minor ‘day to day’ injuries (bumps, scrapes and bruises) that happen to pupils whilst on the school site or during any off site activity. All our signing-in systems can be customised with your name, colour and logo. Our off the shelf report form includes a 2 part no carbon required (NCR) pad and can be ordered with an additional black protective cover. Schools should keep a record of any first aid treatment given by first aiders and appointed persons, either in written or electronic form. These records must be kept for a minimum of three years. Our One-Write systems or NCR pads are ideal for such record keeping. To comply with the Data Protection Act 1998, personal details entered into the Accident Incident and Illness Register are kept confidential with a discreet sheet. The Education Act states that parents are legally responsible for their child’s regular and punctual attendance at school. Maintain accurate attendance records with our comprehensive school signing in systems. All our signing-in systems can be customised with your name, colour and logo. Our paper systems assist in monitoring not only whether pupils are absent with or without the permission of the school, but also why pupils are absent from school. Recorded attendances in paper registers are then used by schools to report on the number of authorised and unauthorised absences for each pupil. Ofsted state that the key features of outstanding safeguarding practice include: rigorous monitoring of absence, with timely and appropriate follow-up, to ensure that pupils attend regularly. 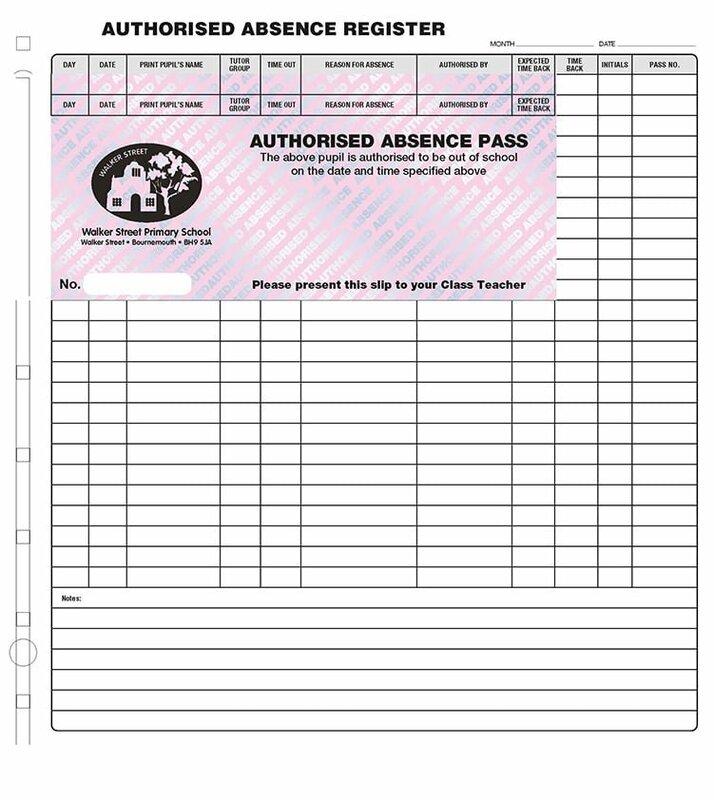 Whilst the pass book or One-Write systems records who is on your premises; for students needing to legitimately leave school, the information is all recorded using our authorised absence passes. A copy of which is then distributed to the pupil. An absentee notice for when the school has been unable to contact parents to establish a reason for a child’s absence from school, with an area for updating contact details. All our signing in systems can be customised with your name, colour and logo. A behavior notice for parents, raising awareness of their child’s behaviour at school. 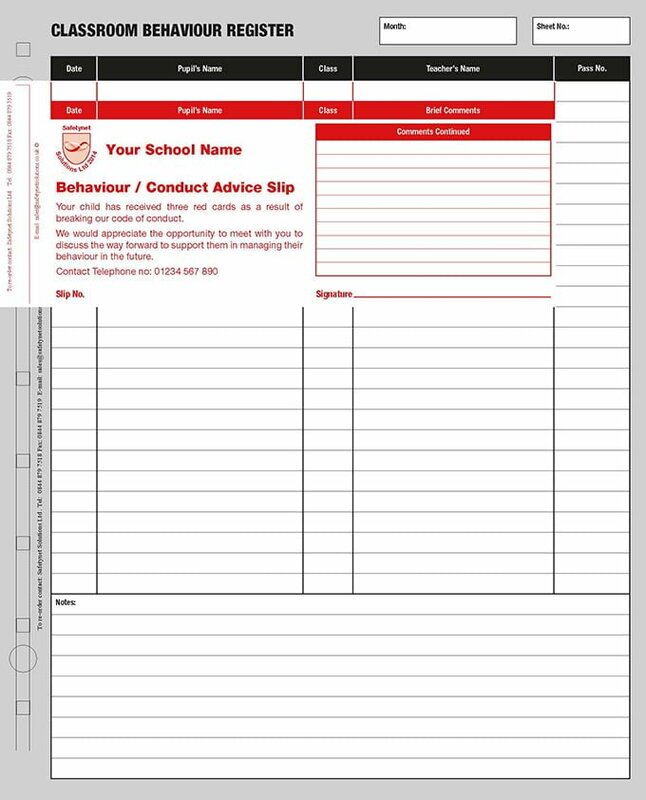 Issue school receipts using our custom printed slips. 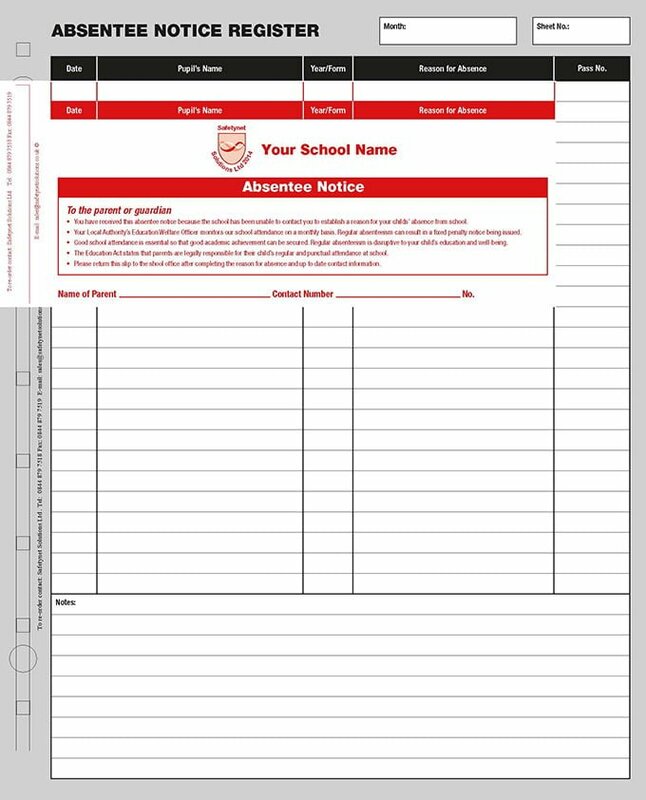 Customise the print with your school logo and choose your own text and form criteria. 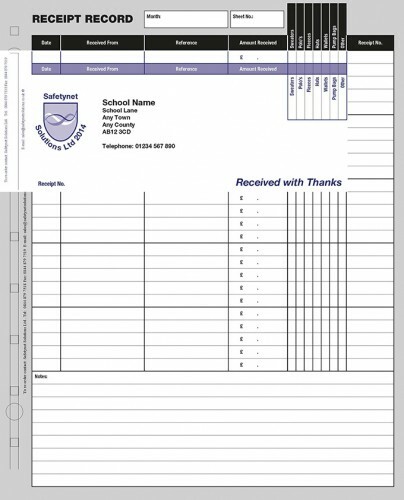 We can also supply school funds envelopes ideal for busy parents and school offices, with helpful boxes for clear labelling. Raise your Ofsted safeguarding score to outstanding by implementing our range of tried and trusted solutions. Discretionary sheets are included for privacy as well as fire registers in the case of an emergency with our One-Write visitor management system. Share your visitor information across relevant parties to improve your school/college safety, knowing who is entering your building and who to refuse entry to with our electronic solution SkyVisitor. 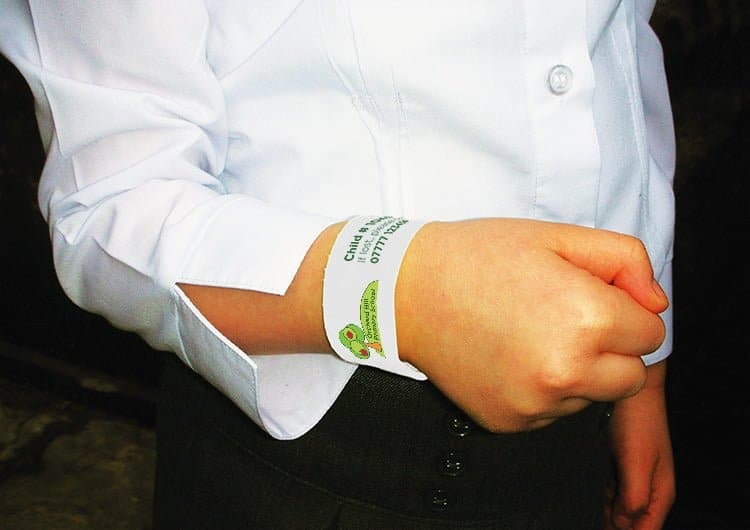 Make your school smart and recognisable by incorporating your logo, colours and motto with our personalised visitor management systems and ID accessories. All our visitor management systems allow for easy record keeping of visitors, contractors, absences and incidents in line with the DfE. Using these systems also helps improve your safeguarding measures. 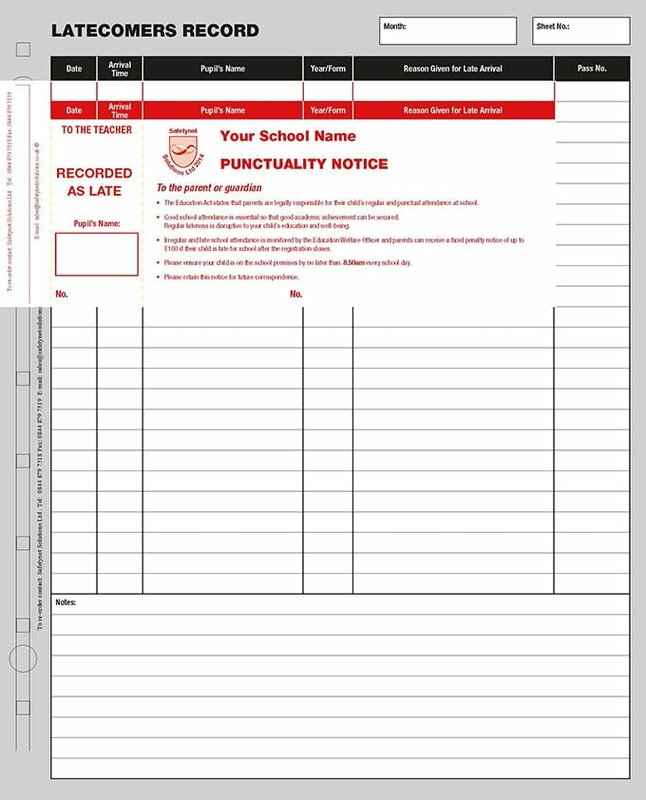 Our paper based systems require minimal input from school office staff and range from a basic visitor book to a more advanced system. Should you require more efficiency and security, our electronic system SkyVisitor is ideal. The software is easy to use, can be scaled to fit your requirements and can be used across multiple receptions and site locations. Our printed products are all produced in-house, meaning there’s no mark up from suppliers. We can guarantee you the best prices on the market, so get in touch for a quote!